XFC 19 is shaping up to be an exciting event with the U.K.’s Simona Soukupova (2-1) slated to meet Felice Herrig (6-4) in the co-main event on August 3. The event will be held at the Grady Cole Center where XFC will make their first ever appearance in Charlotte, N.C.
Xtreme Fighting Championships has officially confirmed the bout via press release. XFC 19 will feature a headline bout between Corey Hill and Jason South who will take each other on in a welterweight bout. The event is scheduled to air LIVE on AXStv. Felice Herrig last fought at XFC 17 in April, where she scored a unanimous decision victory over Patricia Vidonic. 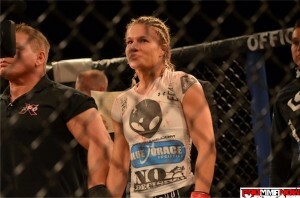 Prior to that victory Felice lost to Carla Esparza via unanimous decision at XFC 15 in December 2011. XFC newcomer Simona Soukupova recently suffered her first career loss dropping a unanimous decision to Karla Benitez at Hombres de Honor 26 in August 2011. Prior to that she defeated both Lisa Newton and Celine Haga via TKO while competing on the regional circuit in the U.K.
Stay close to ProMMANow.com (www.prommanow.com) for all the latest XFC news.